You can never have too many rings! 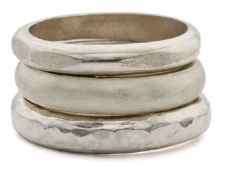 Make three sterling silver stacking rings in this hands-on workshop for beginners and those who want to improve their metalsmithing skills. Learn filing, sawing, forming, soldering, finishing, measuring and layout & take home three rings for yourself or as a gift for someone else.